The Baker Woods Preserve is home to abundant wildlife including black bear, trout, blue heron, beaver and even the occasional passing moose. The Preserve includes extensive river and wetland habitats, a red pine plantation in transition, and native coniferous and hardwood forests. The Baker Woods Preserve was made possible in 2015 by the generous gift of 354 acres from Doris B.N. Baker (The Norman H. Baker and Doris B. Nagel Baker Living Trust). For forty years this secluded, wild place served as respite for the Bakers from their busy Manhattan professional lives. 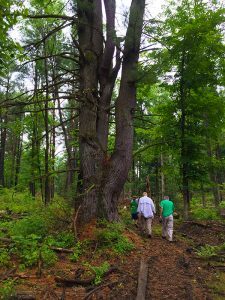 The creation of the Baker Woods Preserve ensures that this land continues to provide a peaceful place to recharge and connect with nature for future generations. More than 3 miles of trails suitable for hiking, cross-country skiing and snowshoeing are open daily for visitors from dawn to dusk. Paddlers will also be pleased to find a beach launch on the Indian River just a short distance from the parking area. Keep up with what’s happening at Baker Woods Preserve by following the blog.